The use of simulation has dramatically increased in clinical environments in recent years because evidence proves that simulation is a value-add proposition. Studies of contemporary medical simulation and its positive effects on patient safety and quality outcomes have repeatedly shown its merit. Among the benefits, simulation training improves team performance, individual performance, and system performance across the healthcare continuum. We know that perfect practice (not just any practice) makes perfect, and the potential morbidity, mortality, and liability from a preventable error can be astronomical. Gone are the days of “see one, do one, teach one,” and now are the days of practice, practice some more, and then introduce these skills into patient care under significant guidance. Simulation is excellent for basic procedural training, for high-intensity training of high-level learners, for team training, and for systems testing. Such training can be applied to any type of scenario. Simulation can help organize and onboard new residents through intern boot camps that include training on electronic medical record systems. Simulations can be conducted with registration clerks and with high-level hospital executives learning how to have crucial conversations. But it is important to understand that simulation is an educational approach, not just a center filled with high-fidelity technology. 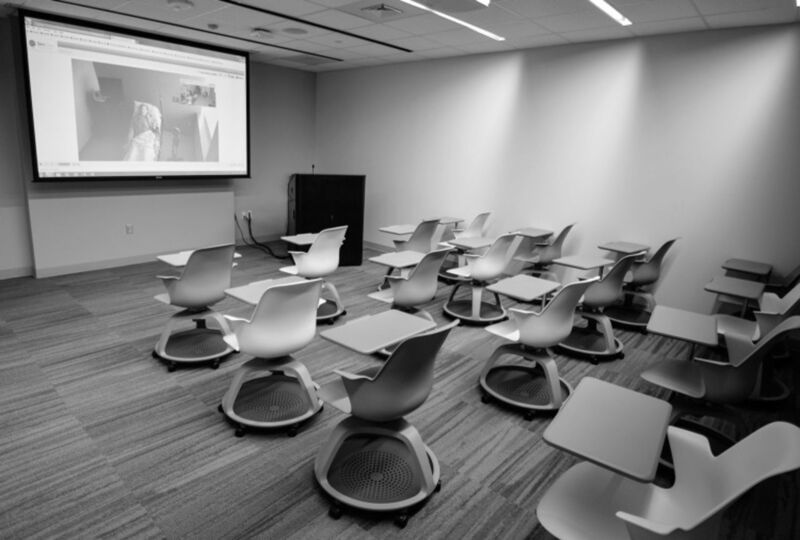 When institutions purchase equipment and open centers without a sound educational approach, the simulators can quickly become expensive underutilized fixtures with no defined educational objective or benefit. Effective simulations start with well-written learning objectives that are balanced to the types of learners and to the length of the simulation. Simulation experts and content experts work together to design a scenario that allows the learner to successfully complete the learning objectives. Several practice runs of well-designed cases naturally evolve over time and improve year over year. At the conclusion of the scenario, trained faculty debrief the simulation using several methods. Feedback and debriefing skills are essential in quality simulation delivery, and these skills can be taught, evaluated, and integrated into the simulation scenario portfolio. The debriefing must be given as much time as the simulation itself and acknowledged to be as important. 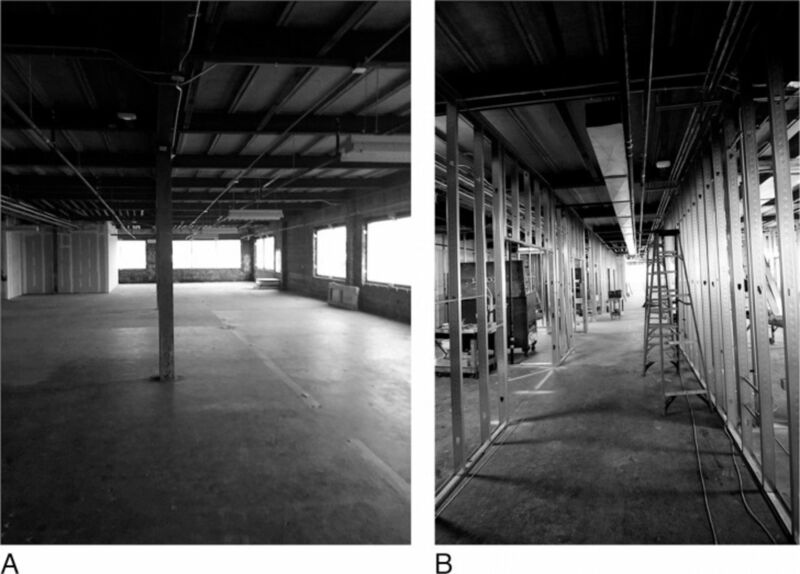 Developed in a former warehouse space, the simulation center began as just an empty shell. The center began to take shape with the installation of wall supports. 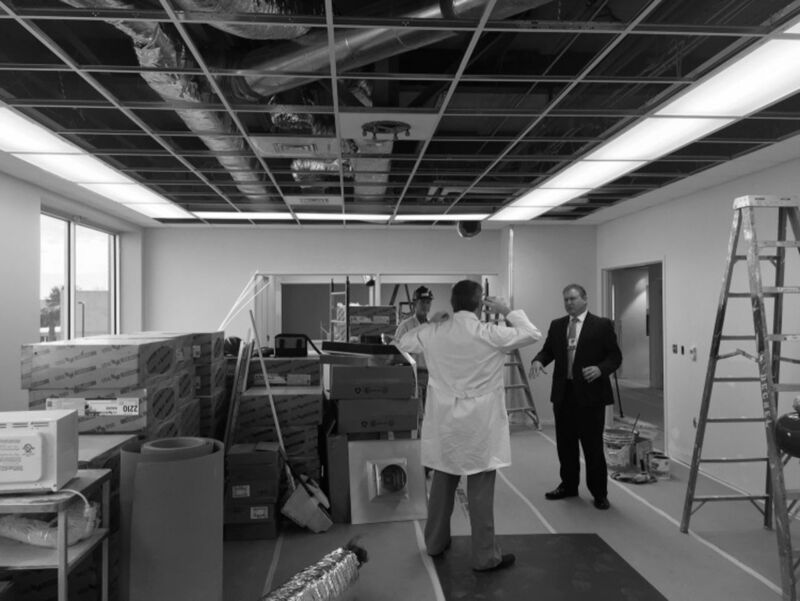 During the construction of operating room 2, Carl Tholen, Assistant Vice President for Undergraduate Medical Education, and Dr Sebastian Koga, Department of Neurology, discuss the future uses of the space. Cameras, microphones, desks, computers, and ancillary items are stacked and waiting to be installed. Students can examine and treat patients in an environment that mirrors the clinical setting of the hospital. The highly sophisticated SimMan 3G can be used to simulate virtually any adult patient clinical scenario. In the all-purpose classrooms, students can view real-time video of scenarios being run in any of the 16 simulation environments. After the scenario is finished, the recording can be played back for debriefing purposes. Examination rooms are equipped exactly as examination rooms in a doctor's office. 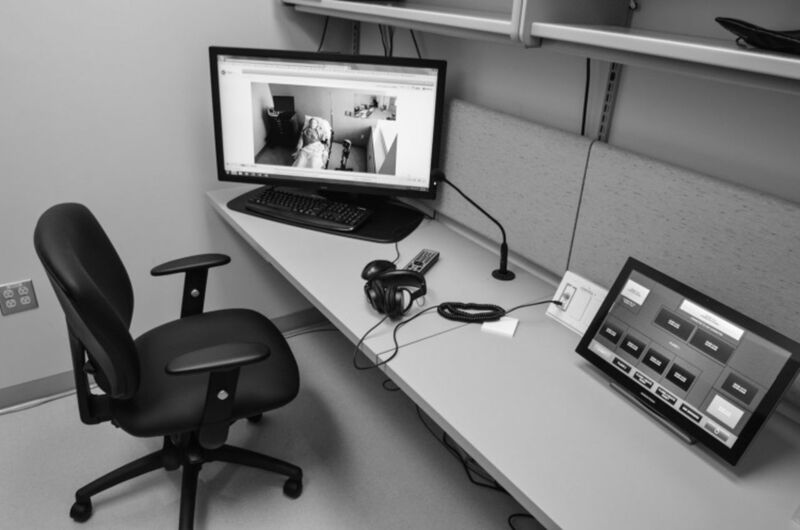 Students practice interviewing patients and performing patient assessments in these rooms. The heart of the simulation center is the control room where all 16 simulation environments can be viewed and all 32 cameras can be controlled. The following narrative represents a typical simulation in the simulation center. This exercise involves interdisciplinary training, a key to improving patient safety in any environment. After the scenario, the entire team goes to the debrief room to review their patient care. With the help and guidance of a facilitator, the team members and any observers talk through all aspects of the case, from bedside manner to ordering and performing diagnostic tests to carrying out the treatment plan. Debriefing is a time for self-reflection and guided reflection that provide the learners with insights to improve their patient care. A new patient has just been admitted to the intensive care unit (ICU) with a rule-out diagnosis of bilateral basal pneumonia. The 77-year-old male has had an initial assessment performed by the ICU nurse. The ICU nurse calls the ICU intensivist to report on the patient, and the physician orders the elevation of the head of the patient's bed, chest films, blood work, an intravenous infusion to keep the vein open, oxygen via a nonrebreather mask at 12 liters per minute, and a 12-lead electrocardiogram (ECG). The patient is pale and diaphoretic, with rapid, labored respirations. Lung auscultation reveals diminished breath sounds in the bases of both lungs. Cardiac monitor shows a sinus tachycardia with frequent unifocal premature ventricular contractions. Oxygen saturation (SpO2) is 94% on room air, and the patient is breathing 28 times per minute, with 3-word dyspnea. The intensivist arrives in the patient's room accompanied by an ICU resident and a medical student. In addition to the ICU nurse, a new nurse hire is in the room, completing his orientation to the ICU. The team works together to reassess and verify the patient's status. Chest films show diffuse consolidation in the lung bases. Laboratory work shows respiratory acidosis and an elevated white count. ECG shows an old infarction of the left ventricle but is otherwise normal. After several minutes of high-flow oxygen, the patient's SpO2 has increased to 96%, but the patient's dyspnea has not improved. After calling for a consult with pulmonology, the ICU intensivist directs his team to start a broad-spectrum antibiotic and administer albuterol treatments. The physicians leave the patient in the care of the nursing staff and go to talk to the patient's family. 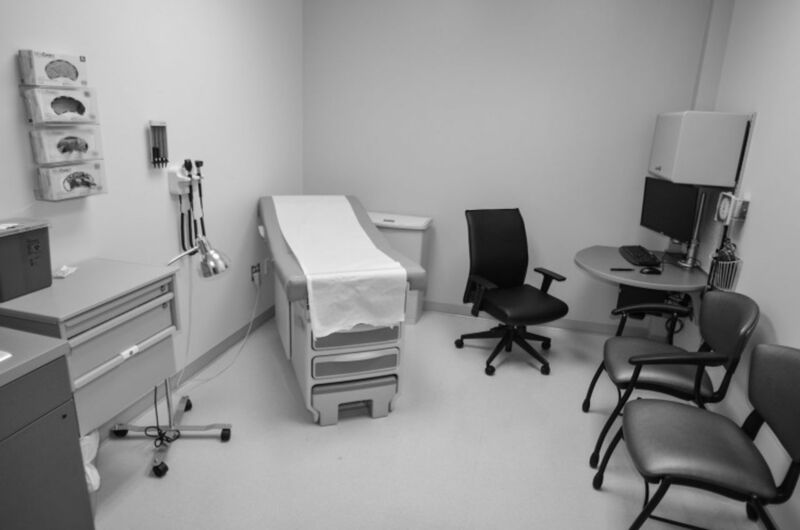 The examination rooms are identical to the examination rooms in a physician's office and are used to practice patient physical and mental health examinations, patient communications, and problem-based learning tutorials. In the operating room suites, we can conduct training in cases such as surgical approaches, malignant hyperthermia, fire, reaction to anesthetic administration, and the team response to crisis. In room 1, a team is having a conversation with a standardized patient regarding a do-not-resuscitate decision for a terminal family member. In room 2, a gunshot victim has just been delivered to the ED trauma bay by emergency medical services, and the patient is bleeding internally from 2 wounds to the chest. In room 3, a physician and a member of the clergy are consoling family members over the loss of their son who just died from leukemia. Room 4 has been converted to a labor and delivery ward, and the team is dealing with a challenging shoulder dystocia delivery. Immediately postpartum, the neonatal intensive care unit resuscitation team works to stabilize the newborn, while the labor and delivery team deals with mom's postpartum hemorrhage. All of these scenarios are coordinated from the center's 2 control rooms where the 16 environments and 32 cameras in the center are monitored and controlled. Cameras in each room can be adjusted, and ambient hospital sounds and music can be broadcast into the rooms when appropriate. The cameras allow the scenarios to be recorded and viewed live in another room by team members or to be reviewed during the scenario debriefing. In addition, simulation specialists run the highly complex physiologic software for the high-fidelity human patient simulators from the control rooms. 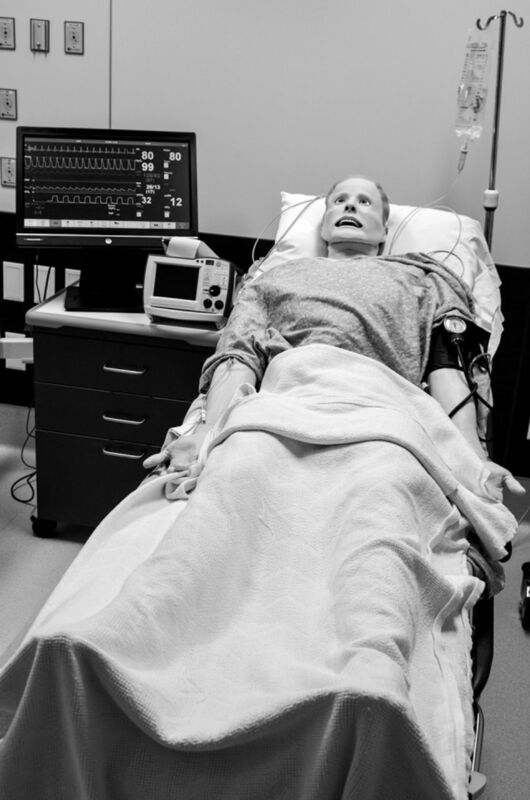 Capabilities of these manikins include the simulated ability to breathe with chest rise and fall, to speak, and to bleed. The manikins have pulses at all standard pulse points, as well as blinking eyes and light-reactive pupils. Learners will be able to administer intravenous fluids and medications, as well as perform defibrillation, cardioversion, and pacing; needle decompression of a pneumothorax; oral and nasal intubation; and cardiopulmonary resuscitation, with the efficacy of the chest compressions and airway management being recorded. The advanced capabilities of these manikins, paired with the clinical environments, mean that we can re-create virtually any patient situation. In addition to immersive simulation, the center also offers task training in procedures such as intravenous access, lumbar puncture, ultrasound-guided central line placement, and airway management. All the environments are equipped with Epic electronic medical record computers, allowing access to patient medical history, as well as the opportunity for learners to practice charting. The Simulation Center deliverables are being orchestrated by The Simulation Training and Advisory Committee, made up of key stakeholders across all disciplines at Ochsner. The committee meets monthly, providing feedback and guidance on simulation content, considering requests for simulation training, conducting quality improvement and risk mitigation activities, and providing feedback on future simulation innovations and development needs. The leadership of the simulation project has included Shelly Monks, VP of Education; Carl Tholen and Janice Piazza, Assistant Vice Presidents of Education; Dr Leonardo Seoane, Head of the Ochsner Clinical School; and Dr William McDade, Chief Academic Officer. Their vision and leadership of this project were crucial to the project coming to fruition. The Ochsner Simulation Center is comparable to centers at other large academic institutions, and we plan to use the center to train students, residents, fellows, faculty physicians, nurses, and virtually any other healthcare worker. Initially, the focus will be on Ochsner team members and Ochsner affiliates, but in keeping with Ochsner's expertise as an academic leader, the ultimate goal is to use the simulation center to teach the Ochsner Care Model to the broader community. Simulation education gives an additional edge to an already stellar academic track record at Ochsner and supports each tenet of our mission to serve, heal, lead, educate, and innovate. Mike Smith, MD, MBA, CPE, FACHE was born, raised, and trained in Cleveland, OH (go Cavs!) and spent 10 years as faculty at Case Western Reserve University where he helped found the simulation training program and open the hospital-based simulation center. He has lectured and written extensively about the uses of simulation in medical education and is the past president of the Simulation Academy of the Society for Academic Emergency Medicine. He is an associate professor, The University of Queensland – Ochsner Medical School. Carl J. Tholen, MEd is Assistant Vice President for Undergraduate Medical Education for the Ochsner Health System and Program Director for The University of Queensland – Ochsner Medical School. He has spent his entire 22-year career in medical education and health administration at the Ochsner Health System. He has an extensive background in clinical education curriculum development and program accreditation.